Sauces, Spices, Techniques & Misc. www.sportingroad.comThis is our old site. Visit the new one at www.sportingroad.com. This video was just released for public distribution, after being featured in Denver Magazine and features the 2010 Denver Polo Classic. We think it’s a hit as we are in the video, as our many of our friends. Keep an eye out for the 2013 Denver Polo Classic videos, which should be out soon. And, while you are at it, check out the new United States Polo Association website. As featured on YouTube from the USPA website. 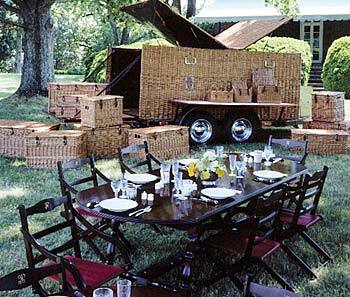 The ultimate picnic hamper was featured in the 2005 Christy’s auction of the contents of Albemarle House, Patricia Kluge’s estate in Virginia. This is the ultimate picnic hamper. 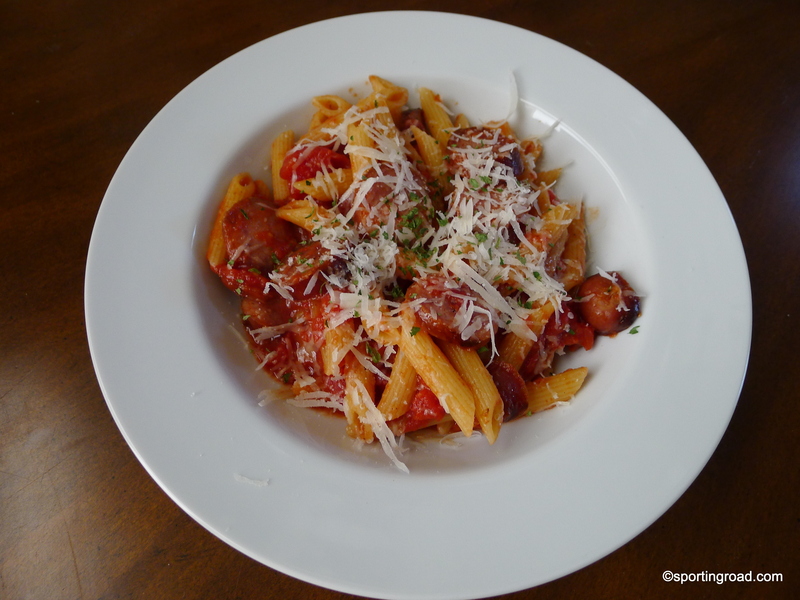 I have been making this dish since college days and the first version of it came to me from a penne all’arrabbiata recipe, which translates as “enraged penne.” The sauce can be hot to very hot, depending upon the amount of dried red pepper that you decide to use. The dash of vodka and heavy cream enhances the flavor and color. This dish only takes about 20 minutes. But the real revelation to this dish came to me tonight, after reading my favorite magazine, Garden & Gun, which is a Southern Living type of magazine only more hip, with shooting and lots of Southern recipes, mostly pork. Only there was no pork this week. So left feeling hungry, I headed off to the kitchen. 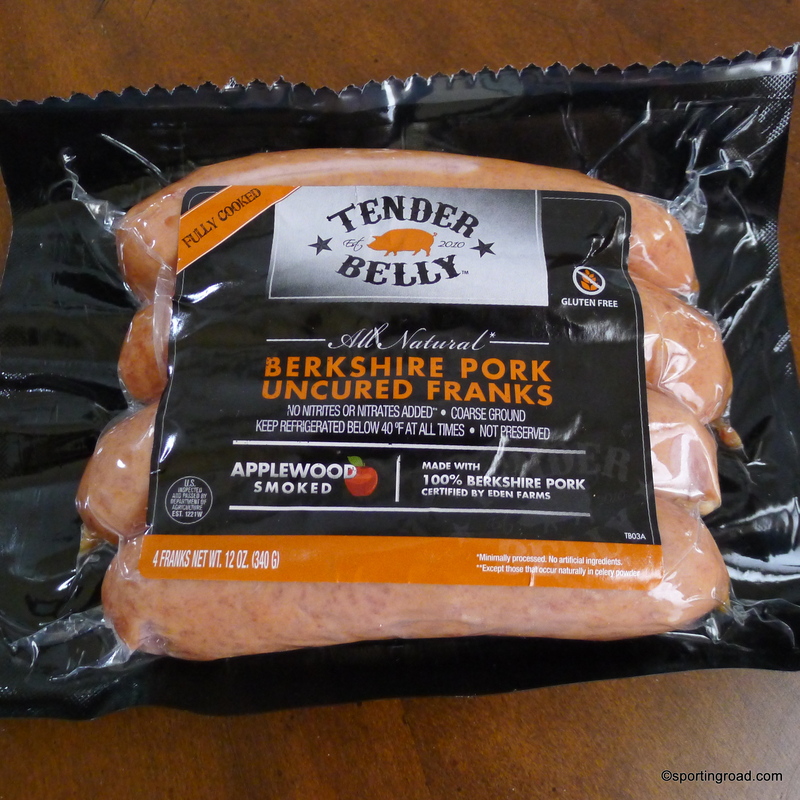 I grabbed some Tender Belly Franks and they say they call them “franks because of the extra effort we put into them. They are uncured and 100% Berkshire pork from the hind leg, coarse-ground like wonderful Old World sausage. They are applewood-smoked and have a subtly sweet and delightfully salty taste. 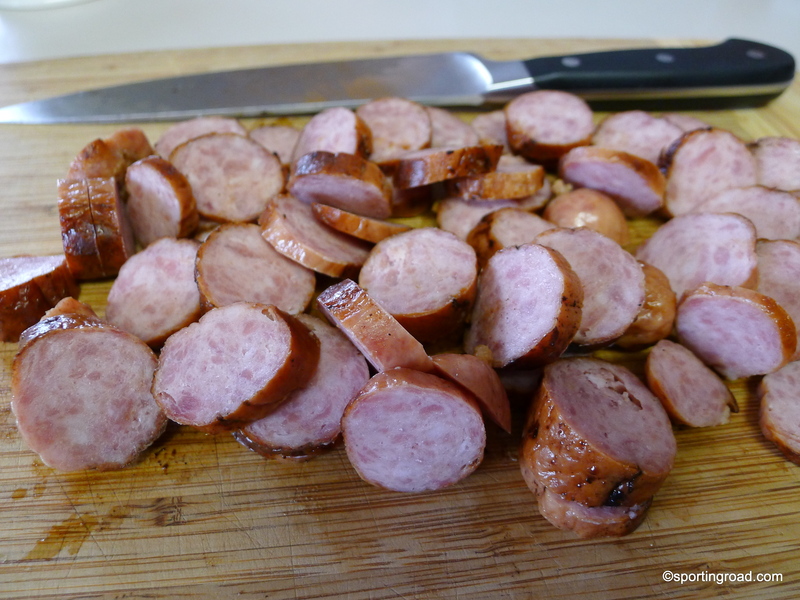 The snap our frank makes when you bite into it is exactly what you would expect….Perfection.” But, these delightful little sausages look like small kilbsa sausages, but they have a taste that is out of this world. There were barely enough left to make the pasta, as my girls started eating the tasty bits of sausage as fast as I could fry them up. In a nonstick skillet or cast iron skillet, fry the sausages in a few dashes of olive oil until browned on both sides, about 5 minutes. Remove to a plate lined with a paper towel to remove the oil. In a separate pan, simmer the tomato sauce with the spices and bring to a simmer in a heavy large skillet over low heat. Add vodka and cook while pasta water is boiling until the mixture reduces by 1/4, stirring often, about 20 minutes. Meanwhile, in a third deep pan, cook the pasta in a large pot of boiling salted water until al dente, tender but still firm to the bite, stirring occasionally, about 8 minutes. Drain the pasta. Stir the cream into the tomato and vodka sauce. Simmer over low heat until the sauce is heated through. Stir in the Parmesan cheese until melted and well blended. 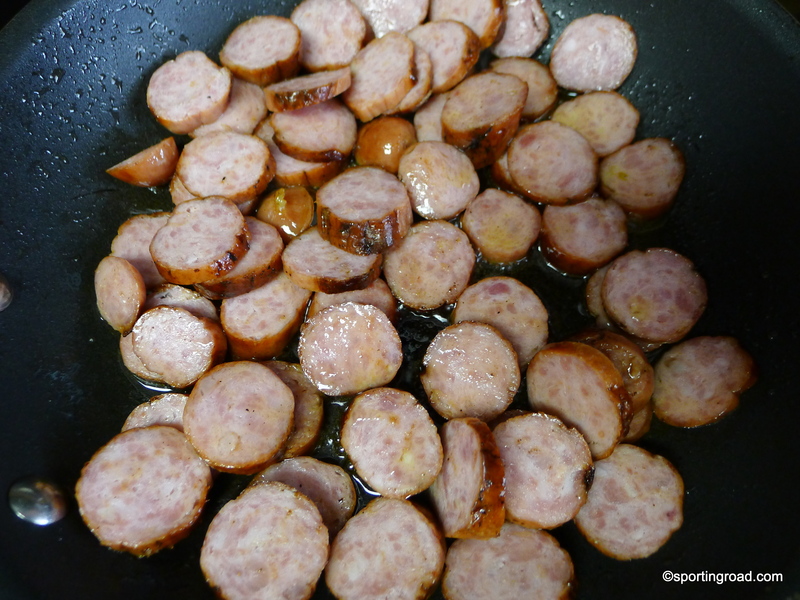 Transfer the drained pasta to the pan with the sauce, and add the sausages, tossing to coat. Serve with more Parmesan and chopped parsley on top. We went through St. Louis at Christmas time. Just to make sure these were the best ribs, we stopped at several St. Louis BBQ joints and I can proclaim these ribs are still the best. 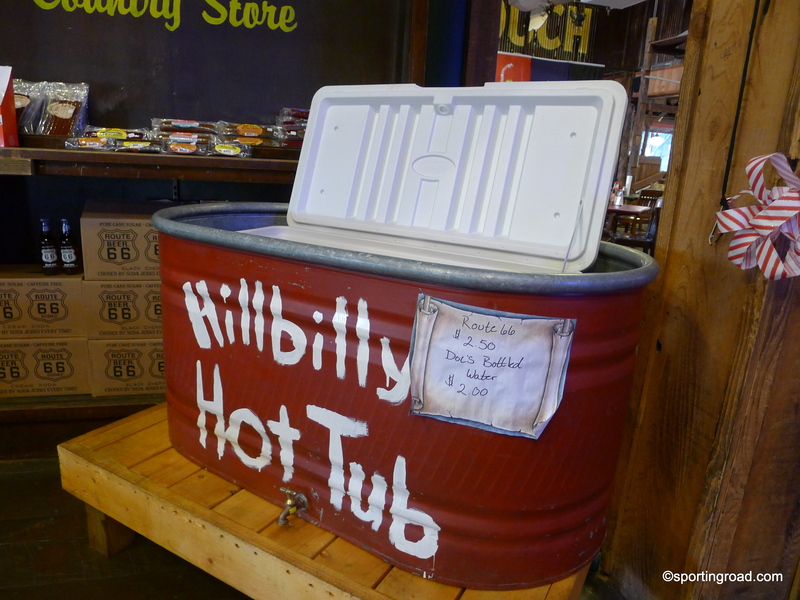 And you don’t need to set up an all day smoker box, nor a hillbilly hot tub (but a hilly billy hot tub helps to hold the beer once you have soaked and drained it), to make them at home. You can make these ribs completely in the oven! I know, heresy in many places, but true. We have tried a bunch of rib recipes including the famous Willingham’s World Championship Ribs and making my own BBQ sauce, but I keep coming back to this favorite recipe, which comes from my Uncle Tom. The recipe and technique are simple and still tastes best for all the homemade ribs that we have found. But we were given some Tender Belly Berkshire pork ribs which make this recipe complete, as it can now be proclaimed the best! 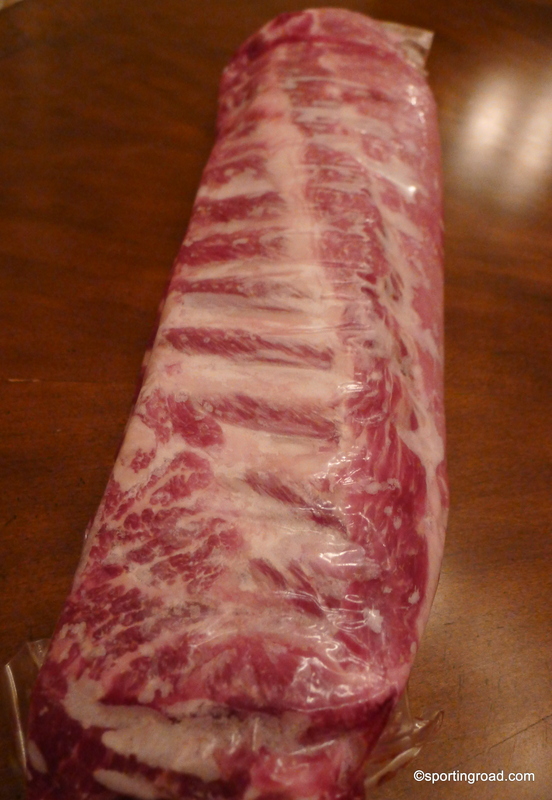 Marinate all ingredients overnight with meat side down (the ribs curving upwards) in a Reynolds oven bag. Make 5-6 holes in the top of the bag with a sharp knife. Bake in a preheated oven, at 325-350F for 2 hours, on a baking sheet. Take out of bag and bake 20 minutes more at 325F on the reverse side, coating with BBQ sauce. Turn and add BBQ sauce to the other side, cooking for 20 more minutes. We have found that Ken Davies and Bull’s Eye BBQ sauces mixed equally tastes like home-made sauce! You can also finish them on the grill for added smokiness, but it really is unnecessary with this recipe, but if you want to show off to your guests and make it look complicated, go for it!